One of our friends and fellow homeschool dads makes the joke that just because they home school does not mean we make our own bread! Those dots just don't connect. This while we all grab another Oreo cookie as we sit around the table. But alas, it is a slippery slope. And our household is on a quest to arrive at healthier eating habits. We've done simple things like buy whole wheat pasta, and drink Kefir, use unrefined organic sugar and choose foods with high fiber in mind. I regularly cook beans and we try to provide lots of greens, yellows and orange foods while eradicating as much white as we can. I try not to buy things that have the first ingredient "high fructose corn syrup" or have "enriched" or "refined" on the package. Not everyone welcomes the lifestyle change. The boys balk at my whole wheat pancakes ... even slathered in (real maple) syrup. We have a long way to go. We still love pizza, tortilla chips and lots of junk food. But we are trying to approach it with a "moderation in all things" attitude. God has been preparing us toward better nutrition for a long time, even before home schooling. (Awesome how he weaves our plans together) I see that more clearly now that Stan is on a low sodium diet due to his ear troubles. You really can't help but eat healthier when you're counting sodium. Have you ever read sodium content on food labels? Horrendous. Out of control. And restaurants? Forget it. Okay, I don't really have a point, except it is kind of a fun journey and a challenge. I long for a Whole Foods store in our city. We'll attempt another garden in our little yard this summer. And we'll continue buying from a produce co-op. Still, I don't do bread. Never have. Things that require rising, using yeast, or involve too many steps just intimidate me (other concepts such as the "rolling boil" also don't connect for me). Stan's the bread maker and he's very good at it. But I tried a recipe yesterday with some graham flour I had. I even cheated using the bread maker (concluding that those handy ready made bread machine mixes are, by george, laden with salt and refined white stuff). Since we didn't have any vital wheat gluten, I "wisely" concluded that maybe we wouldn't need it! I also forgot the salt and sugar (see how hard I'm trying to be healthy?) Pitiful. I said I wouldn't whine or go negative ... BUT! I've been irritated that I haven't had my formatting buttons appear on the post page where we write stuff on blogger. There's been no link button handy for linking to other websites, or bolds, spellcheck, etc. No time and too lazy to type all that html hooha myself ... then I remembered that I was logging on using Safari, Apple's preloaded web-browser. I hate to make any criticism of my sweet apple, but Safari doesn't jive with blogspot. So I reloaded Firefox. and all of my cute formatting buttons now appear. So here are a few links I've been wanting to share. I'm not a big poetry fan, generally. I'm not very smart and usually I don't get it. But my daughter loves poetry. So of course, I love it now too. But the only type I know how to write is Haiku. Haiku writing actually signals something significant to me, it marked the first time that I had forgotten to do my homework, but remembered with two minutes to spare before class, and completed the assignment. Fifth grade. It would mark a pattern in my life (unfortunately) of working "best" under pressure, and beyond deadline whenever possible. Here's some of today's efforts. *the original title to this was Signs of Spring, but the kids came up with After the Winter. Isn't it much more poetical? The picture was taken at Martin Park LAST YEAR in early March. I'm so glad I forgot my camera today, so we could write our pictures! I'm just returned from a ladies' retreat at our church. It was awesome, but emotionally exhausting. I need a retreat from the retreat, and I didn't even help with anything. I've cried a few puddles since I've been back, processing it all. Stan joked that I am supposed to finish all that weepiness before I got home. But not going to go into all of that. Instead I'll share something funny. The weather was cold all weekend. Though we packed our bathing suits (as one friend said, what's a few pounds among friends), there was no way I would be enticed to submerge into the steamy water in the outdoor hot tub unless I never had to get out. Apparently some girls hit the hot tub though. The next morning at breakfast a younger friend asked me if I was out there. She said someone saw the girls out there and commented that it was the "young" girls. But my friend said, No, because she (thought she) saw me out there! Nope! Today, back home, I wore a new shirt. It's one of those long blousey shirts that could look maternity. But it's very cute and soft and the "kids" are wearing them! We took a walk in the neighborhood this evening and one of the neighbors said, "when's the event?" What, I asked, not understanding. When's the event? he said. I'm panicking because I can't understand what he said and feel like an idiot. But so quickly the tables turn! He patted his stomach. The event, he said! Oh. It's just a shirt. No event. I might be gettin old, but not that old, apparently! As Grant approached his fifth birthday, I started noticing that I didn't have an ache. 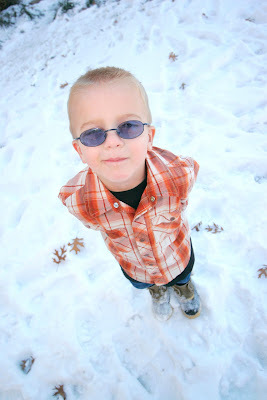 When his brother and sister turned five, I had the mommy ache in my heart. The ache reminded me the end of an era was coming. The end of baby and the BEGINNING of sending them off to school ... every year for the rest of their lives until they move away. Nothing would ever be the same. Over. I didn't have the ache with Grant. Granted (no pun intended), part of me is just tired, and a bit relieved that the days of diapers, potty training, wiping, dressing and other baby chores have left us! But more importantly, I don't have the ache because he's not going anywhere. I don't have that dark fear and dread of the day we walk up to the school and leave him there. These are some of my favorite pictures of Grant, Christmas of 2003. He was not quite two, and I think this marked the first time that we really noticed that our precious third child was going to be a card. We laughed and laughed at him that night. The photos are by our friend, Judson. It was pre-glasses. We didn't realize he was "blind" yet! That would come the next summer. Five years of the most awesome surprise gift from God. At dinner tonight, we all told our Grant stories. And we reminded him that he literally came into this world in a room full of laughter, thanks to Stan's corny joke he told me on the last push. We've been laughing ever since. The day starts with breakfast in bed. Can you see that GI Joe in the breakfasts tray? Who knew the tray doubled as a great military fort! Or maybe it's a POW cell since he's a bad guy. Never has there been a more overused cliche, but oh, how this one applied. We snuck off to Houston last week ... one of the perks of homeschooling. We can pick up and go with Dad pretty easily (with books it tow, of course). I could go on, but why? It's not even necessary to mention the speeding ticket I got in Houston traffic. Shouldn't there be grace for out of town drivers who are novice to big city traffic? And why am I cursed with a lead foot? My son now says that I'm "built for speed." Unfortunately, it's not the first time they've been along when Mom's been pulled over. Or our family budget has suffered for my indiscretions. Shame. Another damper to our trip was Stan's Meniere's kicked up, and he spent a good part of the time spinning (dizzy). We're both really dejected over this because he had one really great week with no symptoms. I think the stress of the breakdown (and living with wife and kids in a hotel for four days?) could have attributed. And eating too much sodium. Our big trip highlight was slipping down to Galveston so the kids could see the gulf coast for the first time. BUT 1) It was Mardi Gras weekend and hotel prices were inflated; 2) it was freezing cold. Still they chased gulls and dipped their toes in the water. And highlight for the boys, we found the big army surplus store in Galveston. They ended up with WWII Austrian gas masks (no doubt from the resistance), and Lydia got a hand-knitted "dress" that was really used as long johns. We did have a blast. Despite my lead foot, I managed to navigate Houston traffic to find the zoo, children's museum, the aquarium and Holocaust museum. And we braved it, and tried out the mass trans system - the kids and I - with the commuters. Adventurous. Giles was an excellent navigator with the map, directions ... and the occasional, "Mom, do you know where you're going?" Yes, I would tell him. I know almost exactly where we're going. So we came back home to our new furnace that was installed while we were gone, after spending the previous week with no heat on the bottom floor. Only to find our water heater leaking! Satan's attacks. He'll not beat us though. Lest we try to feel sorry for ourselves, we keep chanting Phil 4:6 together, and remembering three situations we saw during the trip that let's us know it could always be worse way worse. Our limping minivan made it to the parking lot of a liquor/convenience store in an industrial part of Dallas that obviously was a hub for the homeless. In our hour waiting there for tow/rental, I counted at least six or seven men digging through the trash looking for cans. A few minutes later we gave a handful of cash to our tow guy (another long story). It was ALL of our cash on hand, however, we could get more. We didn't need cans. In Galveston on a beach, a lady in her "home" (rattletrap truck) that was parked over by the mesquite shrubs, asked if we'd give them a jump. That's an interesting scenario. But we did it. The woman had a black eye and no teeth. The man, obviously drunk, frail and limping (Stan said he had a broken hip) and Stan worked for a long time to get their truck started - using their worn out cables. I don't know where they were going to drive it - it would take some time to pack up all of the fishing poles and other gear (junk ... treasures?) piled around. Maybe they needed some heat in the cab (bedroom). Wish we could have helped more, but where to start. Plus, I was afraid. So I'm praying for them. And praying our theme scripture, "Don't worry about anything, instead pray about everything. Ask God for what you need, and thank him for all he has done!" picture of white tiger at the Aquarium (tiger at aquarium?). Kinda reflected our mood. Ha. Ha. More pix later. Time to finish getting ready for Grant's FIFTH birthday party later today! Part of our education day involves reading good books, not twaddle as Charlotte Mason would call it. By the way, had I ever heard of Charlotte Mason when we launched into homeschooling 16 months ago? Nope. I'd barely heard of LM Montgomery, the wonderful author who created Anne of Green Gables. How embarrassing to confess that? Oh well. We started reading it mostly for Giles because his spring home school play is Anne of Green Gables. And I wanted him to be familiar with the book before delving into a shortened script version. I feared he wouldn't enjoy the book. Being about a girl and all. He loves it just as much as the rest of us. Often we have to pause and comment that Anne (aka Cordelia) Shirley is much like our Lydia. Imaginative. Precocious. Romantic. (Quick to temper occasionally). And extraordinarily wonderful. This book has been so good for broadening our (my) vocabularly. We have to have a pen and paper and dictionary nearby to write down our unfamiliar words and then look them up. vim, gimlet, heathen (I knew that one, of course, but the kids did not), wincey, grippe, fortnight. After we read, Giles and I pick out a passage that I dictate to him and he copies. Helps his spelling, grammar and punctuation. Here is today's assignment. Take a deep breath, it's a long one. The orchard, with its great sweeping boughs that bent to the ground with fruit, proved so delightful that the little girls spent most of the afternoon in it, sitting in a grassy corner where the frost had spared the green and the mellow autumn sunshine lingered warmly, eating apples and talking as hard as they could. Fifty-six words. (I made Giles count them). Wew. I could never write a sentence that long or that poetic. I hope my kids will be able to. But my secret wish is that I could play Anne in the play. This is the reaction of someone who just finished his math book. We can pretend a wee bit that we are the Ingalls family during the long winter. A wee bit, of course. We've experienced this last patch of real winter weather without our 21st (actually it's from the 20th) century furnace. The furnace is broken with three separate problems that our heat and air guy tells us spells n-e-w f-u-r-n-a-c-e.
We've all agreed we are very grateful to be living in this century and that we don't have to twist hay to throw in the stove because the coal and the firewood have run out. We are thankful our wheat bag is never empty, the salt pork hasn't run out, and we have enough kerosene to keep the light. Of course we are not suffering, at all. We have a warm upstairs. It's the downstairs unit that is broken. And we have nifty little plug-in heaters to keep us warm when we have to be downstairs where it is a balmy 50 degrees, not the 40 below it was during those North Dakota blizzards of 1860. We marvelled at Pa's wisdom of how modern conveniences had spoiled them. Coal, kerosene and trains were nice ... when they had them. It is a long winter when the train won't come til Spring and the kerosene, coal and wheat are gone. We'll get our new furnace on Monday though.